Though major fleet actions such as Camperdown, The Nile and Trafalgar seem to most as emblematic of the Great Age of Fighting Sail, such engagements were, by their very nature, few in number. 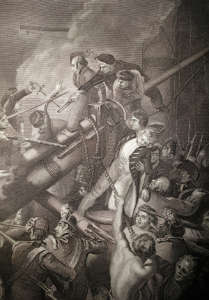 Far more common – and in many cases even more savage – were the “single ship actions” in which one warship met another on the open sea, when each captain and his crew were determined to hazard all, and when retreat was seldom, if ever, an option. 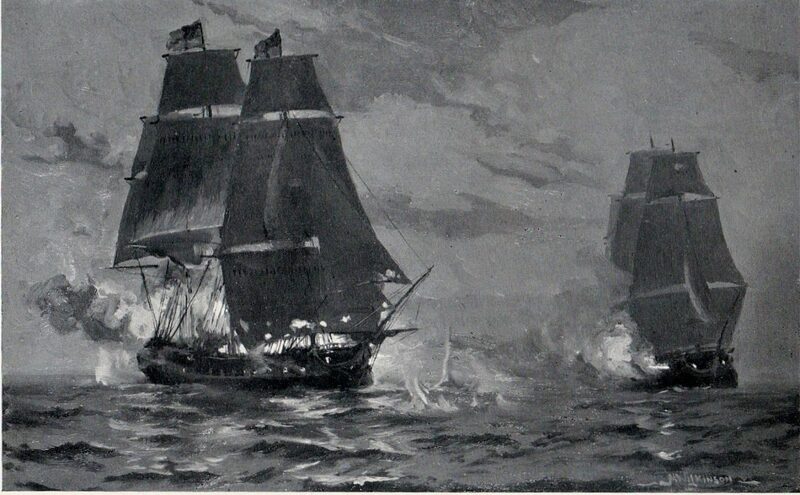 The most dramatic of all such actions were those which matched one frigate against another – these vessels not only being heavily armed for their size and highly manoeuvrable, but commanded by energetic young captains hungry for promotion and prize money. All these features were present in one of the most furious single-ship actions of the Revolutionary and Napoleonic Wars. 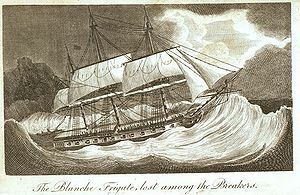 This occurred on the night of 4th-5th January 1795 when the Royal Navy frigate HMS Blanche engaged a French counterpart, the Pique, off Guadeloupe in the West Indies. 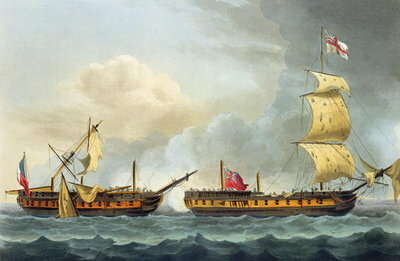 The Blanche, a 32-gun, 12-pounder frigate commanded by Captain Robert Faulknor had been cruising on the West Indian station for several months – exports from French “sugar islands” such as Guadeloupe were critical for the French war-economy and the Royal Navy was committed to doing everything possible to disrupt such trade. 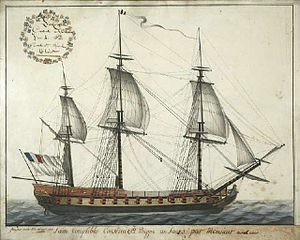 Faulknor was aggressive and on the penultimate day of 1794 his crew managed to “cut out” a French schooner from under the guns of a small fort on the island of small island of Desirade , just east of Guadeloupe. Such “cutting out” was essentially a commando operation, a surprise attack with ship’s boats aimed at hijacking the enemy vessel. Such attacks demanded high levels of skill, confidence and morale and Blanche’s success on December 30thproved that there was no shortcoming in these qualities. Faulknor now took Blanche to stand off the harbour of Pointe-a-Pitre, Guadeloupe, where she was joined by another frigate HMS Quebec (a successor to the vessel of the same name that was involved in a ferocious action in 1779 – a separate article on this can be found in eh “Conflict” section). Within Pointe-a-Pitre lay a French frigate, the Pique, commanded by a Captain Conseil. He resisted the urge to come out while two British frigates waited for him offshore and he remained under the protection of the harbour’s shore batteries. Only after the Quebec departed on 2nd January did he emerge, but for the next two days he cruised back and forth under the shelter of the shore guns until he could be sure that the Quebec was not lurking close by. The artillery duel now began in earnest and for the next hour and a quarter they thundered broadsides at each other, to no obvious detriment of either. The Blanchewas however the faster sailer of the two and she slowly drew ahead. By 0230 she had passed the Pique and it was now Faulknor’s opportunity to rake. The helm was thrown across to lay the Blanche broadside across the Pique’s advancing bows. The damage that Blanche had sustained in the gunnery duel had perhaps been underestimated and as the helm answered the strain on masts and rigging proved too much. The main and mizzen both fell, the only stroke of luck being that they collapsed over the starboard side so that the guns to port still bore on the Pique’s bows. With range now point-blank, Blanche now poured fire into an enemy which could bring no fire to bear in return. The next – and most remarkable phase of the action now commenced. The injured Blanche might have drifted free had the Pique’sbowsprit not run over her port quarter. It tangled in the wreckage there and both ships were now locked together. The French attempted to board, but made the cardinal mistake in such circumstances, that of not devoting sufficient numbers to the assault. As they were driven back by the Blanche’s crew Faulknor realised that boarding now might represent his own best option. Making a virtue of necessity, and intent on holding the vessels locked together, Faulknor ordered that the Pique’s bowsprit to be lashed to the quarter-deck capstan. While this was happening he fell dead with a shot through the heart, command now devolving to his deputy, a Lieutenant Watkins. A few of the Blanche’s 12- pounders on the main deck could still be trained upon the Pique’s bows but most of the firing was now confined to the small-arms men aloft and on deck, and to carronades, and swivels on the two ships’ forecastles. Pique was now taking serious punishment and at 0300 her fore and mizzen-mast went overboard. The force involved broke the lashings holding the ships together so that Pique immediately dropped astern, with Blanche dead ahead. The breeze was light but a sudden stronger puff on Pique’s main top ail drove her into the Blanche again, her bowsprit running over the British ship’s starboard quarter. Despite a hail of small-arms fire from the Pique’s forecastle, the Blanche’s crew managed to secure the Frenchman’s bowsprit to the stump of the fallen mainmast. The Pique’s crew made several attempts to sever the link but were driven back by the Blanche’s marines. was too much for them. Locked fast together, Blanche leading, Pique dragging astern, both ships now drifted uncontrollably ahead of the wind. It should be borne in mind that by now the close-quarters action had been in progress for some three hours. A few of the Blanche’s 12- pounders on the main deck could still be trained upon the Pique’s bows but most of the firing was now confined to the small-arms men aloft and on deck, and to carronades, and swivels on the two ships’ forecastles. Pique was now taking serious punishment and at 0300 her fore and mizzen-mast went overboard. The force involved broke the lashings holding the ships together so that Pique immediately dropped astern, with Blanche dead ahead. The breeze was light but a sudden stronger puff on Pique’s main top ail drove her into the Blanche again, her bowsprit running over the British ship’s starboard quarter. 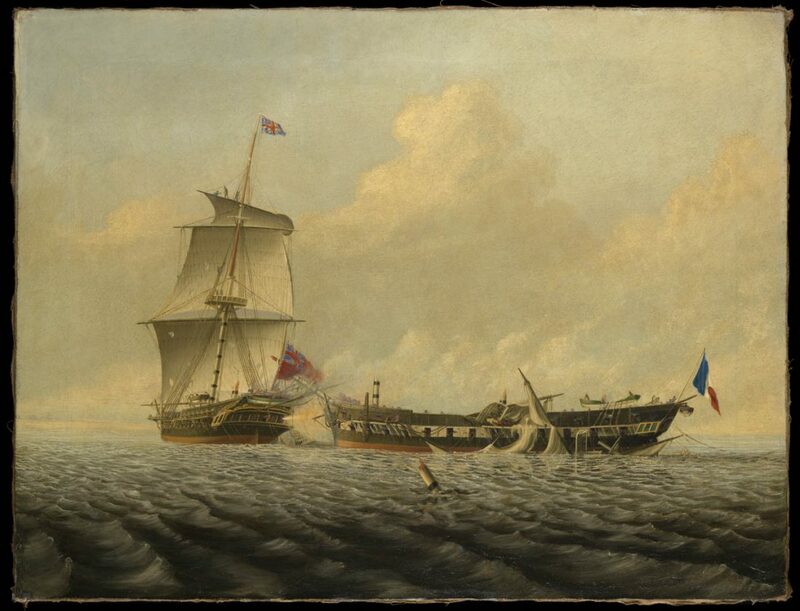 Despite a hail of small-arms fire from the Pique’s forecastle, the Blanche’s crew managed to secure the Frenchman’s bowsprit to the stump of the fallen mainmast. The Pique’s crew made several attempts to sever the link but were driven back by the Blanche’s marines. was too much for them. Locked fast together, Blanche leading, Pique dragging astern, both ships now drifted uncontrollably ahead of the wind. It should be borne in mind that by now the close-quarters action had been in progress for some three hours. 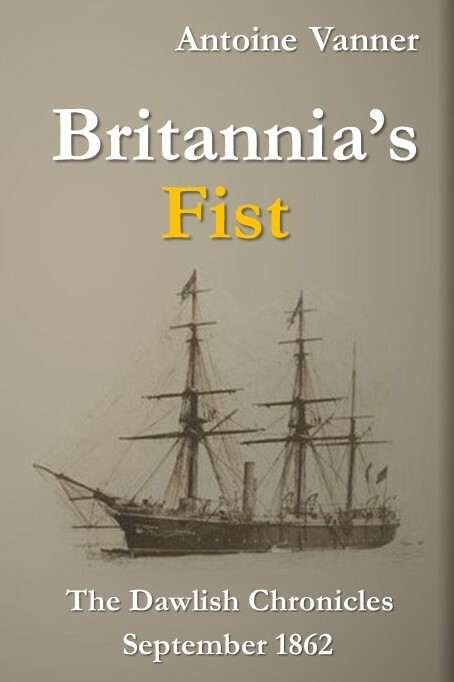 If you’re interested in receiving a copy of this story – and of another Dawlish Chronicles short story, Britannia’s Eventide – click on the image to the left to join the mailing list and to receive your electronic copies.